This entry was posted on May 16, 2013 by Avel Ureno. Most car owners will likely have experienced a dead battery at an inopportune time. By learning how to change out the device, people can avoid a professional towing service and save quite a bit of money. Most of the required labor can be accomplished by amateurs who lack professional mechanical experience. Because old batteries tend to have corrosive substances on the posts, amateurs should always wear goggles and gloves before they begin. Battery acid can cause redness and irritation of the skin. If the corrosive acid happens to make contact with the skin, the affected area should be flushed with cold water for several seconds. This is a general guideline for replacing car batteries. When replacing parts on your car you should first always consult your vehicles owner manual for specific instructions regarding your make and model. All vehicles are not created equally and have their own needs to consider. Before they begin, individuals should always turn off the vehicle and set the emergency break. Once the hood has been appropriately propped up, the negative battery cable can be detached first. A battery wrench, which is tailor made for the task, should be used instead of a screwdriver. The positive cable can be detached next. Batteries are nearly always held in their trays with clamps, which can be loosened with the help of a ratchet. Once the battery is no longer attached to the tray, it can be picked up carefully and removed from the vehicle. Because batteries can be deceivingly heavy, they should be gripped with two hands and lifted from their slots in one smooth motion. Defunct batteries can usually be taken to auto centers for proper disposal or recycling. Before the new car battery is inserted into the slot, individuals should eliminate any corrosion that has developed on the tray. While special cleaning solutions are available, a simple mixture of baking soda and water should also suffice. The cable connectors should also be cleaned with an abrasive brush or post brush. Severely corroded cables can cause a quality battery to fail much earlier than usual. With the tray area cleaned to perfection, the new battery can at last be slowly lowered into place. After the clamp has again been attached, individuals might spray the terminals themselves with brand-name anti-corrosion liquid. Following this, amateur mechanics can reattach the positive cable and then the negative cable. As long as the battery itself is held firmly in place, the electrical connection should be plenty strong enough. 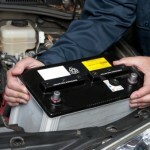 After the replacement process has been completed, car owners will want to examine the new battery from time to time. Corrosion can usually be wiped away with a strong brush and a bit of baking soda. In hotter-than-average climates, batteries can begin to decay within just a year or two. By buying quality batteries from reputable retailers, drivers should be able to keep their vehicles in top-notch shape for several years. Many auto parts stores, in fact, sell portable battery test kits. With the proper tools and equipment, amateur mechanics can remove and replace a car battery with ease.